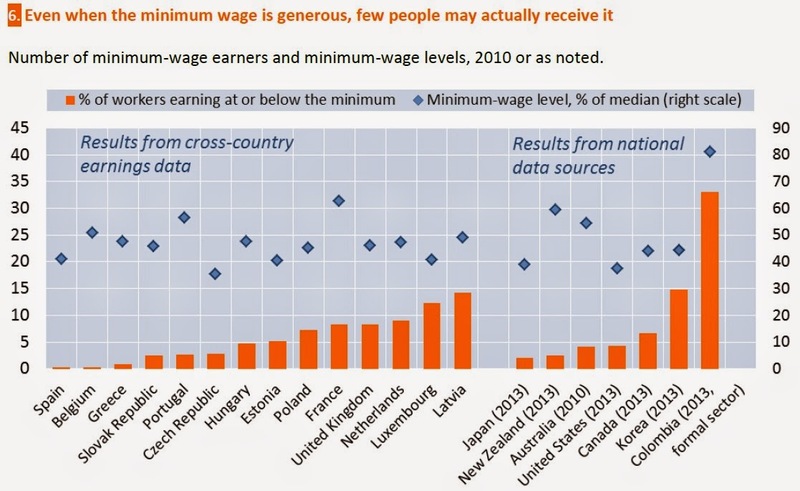 How do minimum wages around world compare, and how have they changed in the last few years? 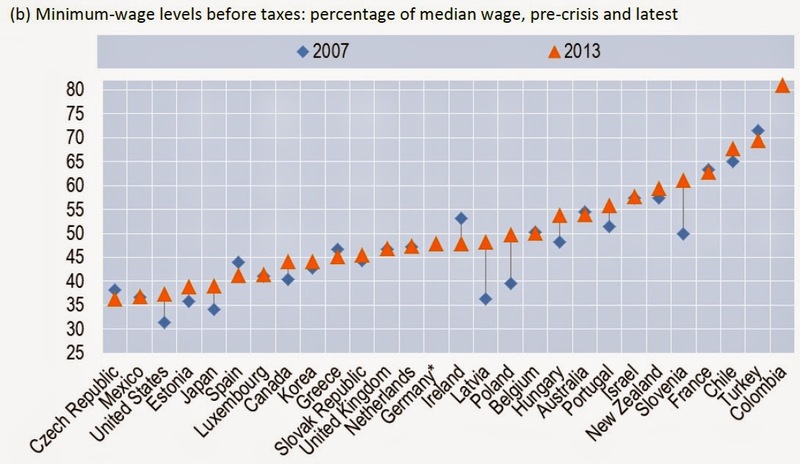 The OECD offers an overview in a May 2015 FOCUS report called "Minimum wages after the crisis: Making them pay." As a starting point, here's the minimum wage relative to median income in various countries. The blue diamonds show the proportion in 2007; the orange triangles show the proportion in 2013. The minimum wage stayed the same or rose in most countries, with a few exceptions like Ireland, Greece, and Spain. The US would have ranked lowest in ratio of minimum wage to median wage in 2007 (lowest blue diamond), but ranks third-lowest after the recent increases. Of course, some will see this relatively low level as cause for concern, while others will see it as cause for congratulation. The minimum wage as a share of income for Colombia may be misleading because it applies only to workers in the "formal" sector of the economy, and those in the informal sector would on average have lower wages. As a different metric, how many hours does a person need to work at a minimum wage job before they reach total earnings of half the minimum income? 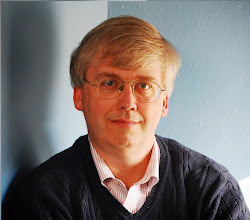 The calculation here includes an adjustment for payroll and income taxes paid, as well as for other cash benefits being scaled back. 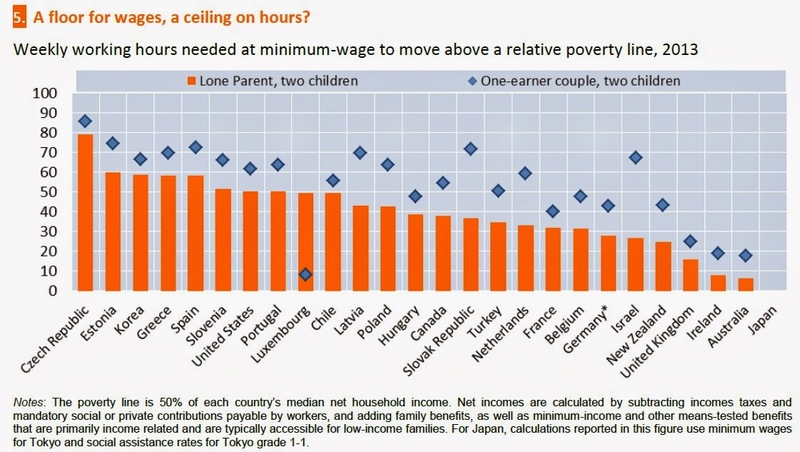 The orange bars show the number of hours for a single parent with two children; the blue diamonds show the number of hours for a single-earner, two-parent couple with two children. Of course, assumptions about the number of hours a person would need to work at a minimum wage job are based on the assumption that such a job is in fact available. Finally, what share of workers is actually paid the minimum wage? Of course, this information gives a sense of how many workers would be directly affected by altering the minimum wage. The orange bars show the share of workers getting the minimum wage by country (based on differing data sources), while the blue triangles are a reminder of the minimum wage as a percentage of the median wage in each country. One would expect that countries with a high minimum wage would tend to have more workers receiving the minimum wage, but that pattern doesn't always hold. For example, the share of the population in Greece and in Portugal being paid the minimum wage in those countries is lower than in the US, although the minimum wage in those countries is a higher share of median income.